The holidays are coming and soon we will be pulling out the decorations. Items that stay packed away for most of the year will get their moment in the light. But what does that have to do with downsizing or moving? Well, when we think of downsizing our things, we often work hard at considering and downsizing only the items that are in plain sight. It’s easy to forget that decorations and accessories for special occasions can take up a lot of space too. Year after year, we pull out the decorations and supplies. We use them and then tuck them away without sorting through and being intentional about what we keep. Once they are tucked away, they are out of sight and out of mind. This is true not only of Christmas or Hanukkah items but also Valentine’s Day, Spring/Easter, Fall/Halloween, Thanksgiving, birthdays, etc. The list goes on. Plus special occasion-related items are not limited to the decorations we like to display. It also includes items we use only at special times like specific baking pans, cookie cutters, serving dishes, candles and linens (tablecloths & towels). This can add up to a lot of stuff. 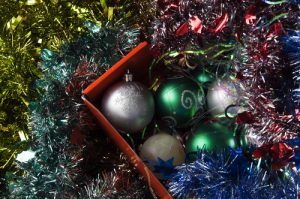 As you get your decorations out this year, take time to declutter by evaluating what you need, want and actually use. First, start with your goal in mind. If you are going to be moving, you can lighten the load and lower the cost of your move by letting go of some of these items. If you are downsizing, you can create more space in your new home by reducing what you take with you. The less space you use to store these seasonal items, the more you have for living and enjoying. Second, evaluate your special occasion items with a new mind set. Don’t get stuck thinking that because you have always had or used a particular item you need to keep it. Try to see your things with new eyes. Think about how you celebrate now or will celebrate in the years to come, and consider whether each item still fits into your life. Perhaps you used to host Thanksgiving dinner for the whole family but now a relative hosts the dinner. You may have needed that extra-large turkey platter in the past, but now it’s no longer necessary. Perhaps you have cookie cutters that you used when your kids were young. The cookie cutters were useful then, but the kids have grown and making homemade sugar cookies is not part of your life anymore. Perhaps you are choosing to simplify decorating and decorate a smaller tree with fewer ornaments. Being thoughtful about what you actually need now will help you make better decisions about what to keep and what to let go. As you are taking out or taking down decorations throughout this year, stop and think. With your present life in mind, think about what decorations and accessories you should keep and which to let go. Think about your goal (moving or downsizing) and how these small steps can move you towards it.